This Parfait Recipe is an eye-popping, delicious reminder of America and the freedoms we enjoy. Time to celebrate America? Is it Memorial Day or maybe the Fourth of July? Actually, we need to celebrate America every day! This is a fruit dessert recipe I use on at home and at the restaurant. It really makes a visual statement that people enjoy. A parfait is usually frozen custard with cream and often a fruit puree. 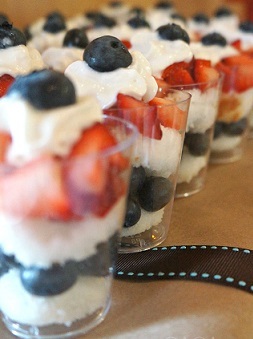 This easy parfait layers strawberries and / or raspberries and blueberries with vanilla yogurt and whipping cream to give you a beautiful red, white and blue dessert recipe. Your guests will be flabbergasted with the eye appeal and taste of this refreshing no-cook restaurant dessert. Preparation time: 15 minutes. Serves 6. Good for the eyes, good for the tummy and good for you! 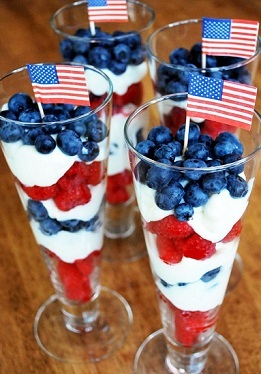 Enjoy your red, white and blue parfait and the company of those you share it with!